Tiger Lilies (Lilium columbianum Leichtlin), also known as Columbia lilies, are native to North America. The orange flowers, which may or may not have speckles, grow up to 4 feet tall. They add color and variety to the home garden. The flowers have six petals and blossom during the summer months. The best time to transplant tiger lilies depends on whether you are working with bulbs, bulbils, scales or seedlings. Tiger lilies are a good choice for the novice gardener. You can propagate lilies from bulbs, bulbils, scales or seed. During the growing season, the flower bulb will produce several smaller bulbs that remain attached to it. Even the tiniest bulb in the cluster is fertile if it has roots growing from it. If you want to plant seeds, then do not remove the spent flowers from the plants. This will encourage the plant to produce seedpods. 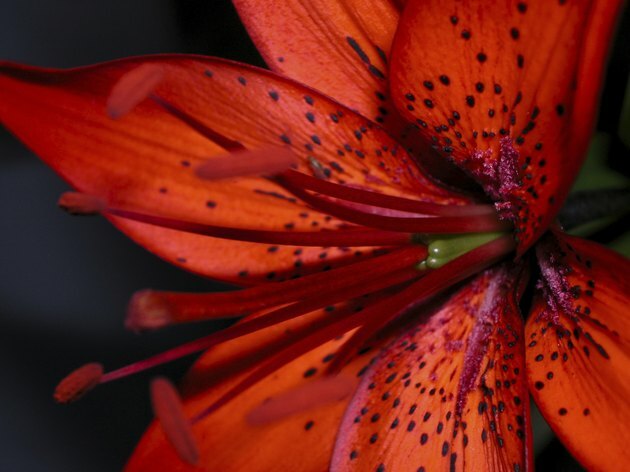 As tiger lily bulbs never become dormant, according to North Dakota State University Extension, you need to choose the best time to transplant them. The best time is during autumn when the weather is chilly, and after the plants have died back. Dig up the bulbs, separate the cluster and then immediately replant them approximately 1 foot apart. This spacing gives the plants enough distance for healthy growth and flowering. Bulbils produce bulbs one to two years after you plant them. You will find bulbils on the mature leaves of the tiger lily in late summer or early autumn. They look like plump black beads. Carefully remove them from the leaves and immediately plant them in furrows, recommends the North American Lily Society. As soon as your tiger lilies finish flowering, usually in late summer, dig up the bulbs and remove from four to eight scales from each one. Do not touch the inner layers of scales, as they provide nutrition to the bulb. Additionally, you can remove the same number of scales from newly purchased tiger lily bulbs before planting them. The scales will grow bulblets and form roots. Find detailed directions for transplanting scales in Resources. Harvest only the brown seedpods, as they contain mature seeds. Depending on your weather, the seedlings should be ready to transplant from 6 to 8 weeks after sowing. Harden off the seedlings for approximately two weeks before transplanting into your garden Plant them in the spring when the soil is warm and all danger of frost is past. How Do Lily Plants Reproduce?